Grease filters are designed to remove grease and particulates from exhaust air streams. The most common grease removal filters currently in use are the baffle-type. Permatron’s metal grease baffle filters are available in three models. Our metal grease filters are made of galvanized steel, aluminum or stainless steel. How Do Metal Grease Filters Capture Grease? Model GFG constructed of galvanized steel for a maximum temperature 450 degrees F; Classified by UL (grease) NFPA std. 96. Model GFA constructed of aluminum for a maximum temperature 250 degrees F.
Model GFS constructed of 304 stainless steel for a maximum temperature of 900 degrees F; also available in 430 stainless steel. 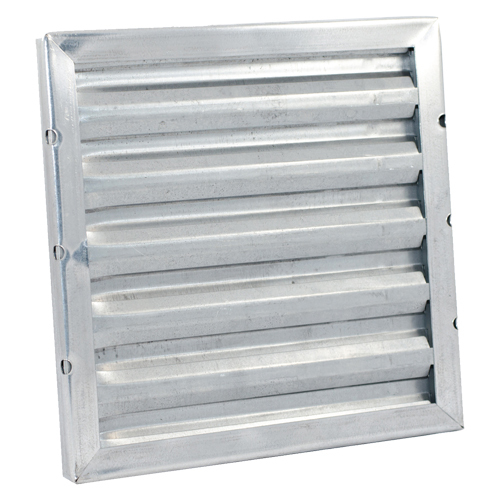 Permatron metal grease baffles are designed to collect and drain grease into a trough, and prevent flame pass through.